EThekwini Municipality’s top leadership has heaped praise on the Durban International Convention Centre (Durban ICC) for achieving a clean audit opinion from the Auditor-General of South Africa, Kimi Makwetu, for the 2017/18 financial year. Speaking during the Municipality’s Annual Report Presentation held at the Durban ICC on 15 February 2019, Chairperson of the Municipal Public Accounts Committee Councillor Thabani Luthuli, who was representing Mayor Zandile Gumede, commended Durban ICC CEO Lindiwe Rakharebe for her commitment to good governance. “The 2017/2018 financial year has been an exciting year for local government, in that we are now into the fourth generation of democratic local government. Some of the highlights are the Municipality received an unqualified audit opinion for the 2017/2018 financial year. The City maintained a credit rating of AA+ in long-term, A1+ in short term. The Municipality has had a good revenue collection, liquidity and cash flow management, especially considering the current economic conditions. We also congratulate the Durban ICC and uShaka Marine World for their clean audit achievements,” said Councillor Luthuli. The Durban ICC is an entity of the eThekwini Municipality. In line with national and local government’s developmental agenda, the Centre remains committed to broadening the economic impact of the events and tourism sector through contributing to inclusive economic growth while operating in a responsible and profitable manner. Rakharebe said this is the fifth consecutive year that the Centre has maintained its clean audit achievement. “The Durban ICC has again performed well during the 2017/18 financial year in the midst of challenging economic times. This audit opinion affirms the Durban ICC’s commitment to transparency, good governance and statutory compliance. We continue to excel in driving local economic growth having contributed R4.7 billion to South Africa’s Gross Domestic Product last year. The vast majority of this impact was felt in KwaZulu-Natal, where R4.6 billion was added to our Gross Geographic Product,” said Rakharebe. 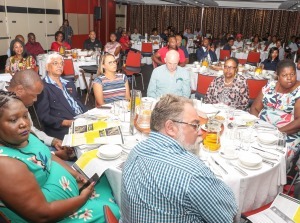 The Centre hosted 456 events in the past financial year and continues to deliver on its mandate to generate income for the City of Durban and KwaZulu-Natal province. During the same time period, the Durban ICC hosted a total of 21 international events and 435 national events. Corporate events accounted for 39% of all events held in 2017/18, followed by Government at 25%, Associations at 20% and Private events at 16%.